At Saban Forum, Prime Minister says stopping nuclear program is not enough – policy must change, too. 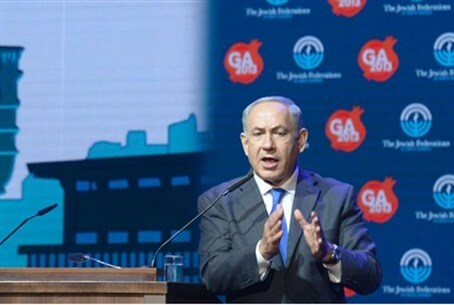 Prime Minister Binyamin Netanyahu spoke Sunday at the Saban Forum and said that stopping Iran's nuclear program is not enough – Iran's policy of genocide must change, too. Netanyahu quoted incendiary statements by Iran's leaders, who called Israel "a rabid dog," among other things. The Iranian regime, he said, "is committed to our annihilation and I believe that there must be an uncompromising demand at the Geneva talks, for a change in Iran's policy. In other words, there needs to be not just a change in the capability of Iran to arm itself, but also a change in its policy of genocide. I do not think that I or anyone can exaggerate the threat that Iran poses to the Middle East." Regarding the negotiations with the Palestinian Authority (PA), Netanyahu said that "I have taken difficult decisions in order to advance the peace process and am willing to make more difficult ones to make peace. He expressed his willingness to make "painful" concessions, including withdrawing from some Jewish communities in Judea and Samaria. UN nuclear inspectors arrived in Iran on Saturday to visit the Arak heavy water plant for the first time in more than two years, AFP reports, citing the Iranian ISNA news agency. The visit comes just weeks after Iran clinched a landmark nuclear agreement with world powers, under which it will freeze or curb some of its controversial nuclear activities in return for limited relief from crippling international sanctions. Netanyahu said that a "military option" was "necessary" for the success of negotiations aimed at reining in Iran's disputed nuclear program. He said the Jewish state shared US President Barack Obama's "preference" to pursue diplomacy, "but for diplomacy to succeed, it must be coupled with powerful sanctions and a credible military threat." "A diplomatic solution is better than a military option but a military option is necessary for diplomacy to succeed as a powerful sanction because of the pressure." Without the prospect of a military option, sanctions "will begin to unravel" in the wake of last month's deal, Netanyahu said via video link. "Steps must be taken to prevent further erosion of the sanctions because ultimately the sanctions remain an essential element of the international effort to compel Iran to dismantle its nuclear military infrastructure, to take apart all its centrifuges," he said. "We shouldn't assume that more and tougher sanctions won't lead to a better deal." "Preventing Iran from achieving a nuclear weapon capability is the primary challenge of our generation because a nuclear Iran would literally change the course of history," Netanyahu said.